The New Year: 2019, Le Petit Hotel’s approach. We are all talking about how fast 2018 has disappeared, and how quickly the New Year is appearing, and in the mix has been the discussions on December’s changeable at best, weather. Certainly some of those farmers growing grain crops are probably very happy and looking forward to a hot & dry January February period now…the rain would have done its magic. There may be thousands of cows out in the paddocks now, but when at least my ancestors arrived, they seized the moment, and worked 6 days on farms that were predominantly grain producing…particularly in North, South and Mid Canterbury. Yes there were cow farms, but not on the scale we see now, owned by conglomerates. It was also saddening to read a few days ago in the Washington Post that many dairy farmers in the US are essentially being driven off their land by the concentration of and buy-outs of small farm holdings, so what appears to be a global movement, is affecting many many ordinary , you could say middle income people…not necessarily for the common good, but rather for an increasingly smaller group of already wealthy people. What does the reported Chinese proverb say…”May you live in interesting times” ..maybe not the best times! Certainly none of us can accurately anticipate what the New Year will bring in terms of ever increasing changes in society, industry and science. If you are reading this post, you may have noticed our very new mobile/smart phone/tablet compatible format, which we hope meets both Google’s business system requirements and at the same time makes it easy for travellers to seek us out. Early indications just over a handful of days, suggests that our improved web presence is both productive and a welcome one. I believe that Google has indicated that more than 60% of Web searches at least initiated on small hand held devices now. 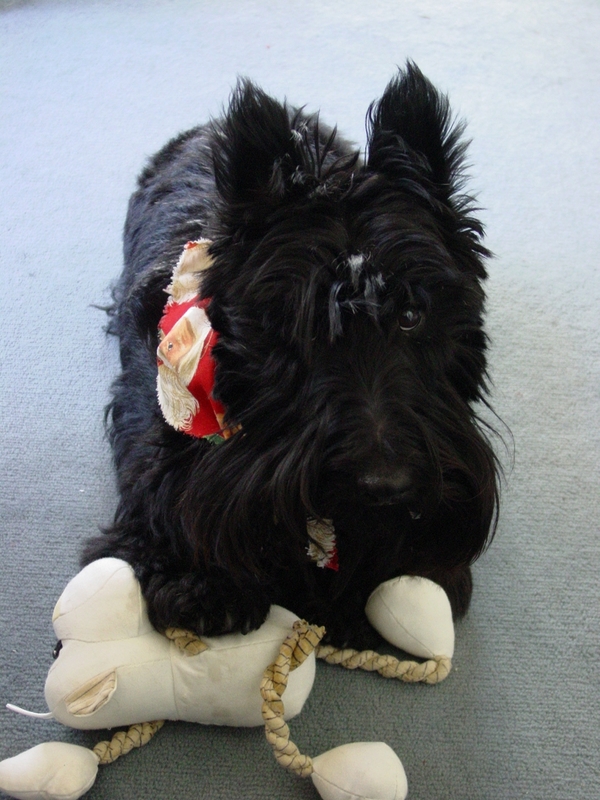 Many of our guests will be familiar with the Le Petit Hotel formula and part of that, a very important part, is the presence of our beloved Scottish Terrier. We have our serious concerns at the moment about her health and we are pouring in the TLC at the moment….however again from a global perspective, the genetic pool for genuine Scottish Terriers is quite depleted, and worldwide many do not live to grand ages, because of their predisposition to the big C. Rest assured we are giving her our very best . The period between Xmas and the New Year is a strange one from many aspects..and in particular for “Kiwis”,who like birds of a feather, migrate to other parts of the country trying to catch the long hot Sumner in the right place at the right time. So its appropriate that we should at this point wish every one, including our incoming and departing guests a very happy, safe and even prosperous, New Year. We see a large proportion of international guests choosing to stay with us; from Antarctica staff on leave, to very interesting travellers from Norway, Russia, Latvia, & Estonia, to name just a few far distant countries. And so it was that a few days ago, a couple who spent 2 nights with us as guests, gave us a quick review on-line with 10/10 plus the comment that the place had good vibes. That was a new one for Martine & myself, but we would be the first to acknowledge that there is good karma within the walls of Le Petit Hotel, and our Scottie dog plays a big part in that. Travellers arriving at Le Petit Hotel can’t help but notice the distinctive juvenile pine trees – Pinus Pinea, on the street frontage. Our original news item copied below was published on the 4th Nov. 2010. Still in their formative state, their umbrella type canopy is just beginning to take shape. Needless to say, we are looking forward to trying the species in our own unique NZ climate. It’s interesting to note that the Pinus Pinea species is the one that produces genuine edible pine nuts, the tree and its nuts having a history of more than 6000 years at least. Menu option for travellers who endure food sensitivities ( sometime serious) arising from certain ingredients which typically requires them to have gluten free and or dairy free breakfasts. Le Petit Hotel management are more than happy to make adjustments to the continental fruit /cereal etc plus croissant breakfast to meet these requirements. Simply add your request to your accommodation booking notice. Being a genuine French Bed & Breakfast, our renown fresh baked croissants are always available each morning, along with genuine french plunger coffee, hot chocolate, or a variety of teas, together with fresh fruit and yogurt. Recently, …made in France – French Brioche has been added to the petit déjeuner. 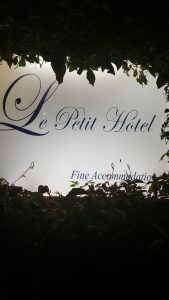 Le Petit Hotel accommodation provides boutique French B & B lodgings for all travellers, both domestic and international. The property is located by the beach in Sumner; the premier seaside suburb of Christchurch. Unlike most AirBnB properties, managers – Martine and Bruce are on-site 24/7 and are focused on providing genuine hospitality to all guests. However the privacy of individuals is very much respected when required . Both short & long stay guests are most welcome at Le Petit Hotel’s unique retreat from the city bustle. The daily room rate includes a served French breakfast and the hotel has free high speed data/WiFi services throughout the complex. The en-suite accommodation rooms are most suitable for 2 adults. Le Petit Futé est un voyage Guide de tourisme et de Nouvelle-Zélande – Bons Plans, visites, conseils et practical information. Le Petit Hôtel Sumner fournir un hébergement B & B en français langue voyageurs, et est également l’emplacement consulaire française à Christchurch. Hi there all Scottie lovers…It’s almost 15 months since I left behind my friends at Juscot Kennels in Hamilton, and I’ve had my 1st birthday at Le Petit Hotel. Despite having inherited a twisted right hind leg, I’m doing my utmost to be part of the hotel day to day operations…answering the door, checking the guests in, plus security duties, so much so that several of Bruce & Martine’s guests have suggested that I climb into one of their suitcases & go home with them… Unlike many of my 4 legged relatives, I have developed my own vocabulary for use in the hotel..eg. when I want to go outside, I don’t bark, but I do a bit of a quiet sing song. I’m also quite good at singing along with the piano! Sometime in the next few months, I’m going into hospital to get a CT scan done on my crooked leg, to see what can possibly be done to help me…but I’m a good patient, so it won’t be a problem. My shiny black coat at the moment makes me a difficult camera subject, but attached here is a recent photo taken on Christmas day with one of my presents. At the Marriner street frontage of Le Petit Hotel, Martine has some Lavender of the ‘Grosso’ variety growing. This particular lavender is a (heavy oil bearing) hybrid between Lavandula angustifolia and Lavandula latifolia. 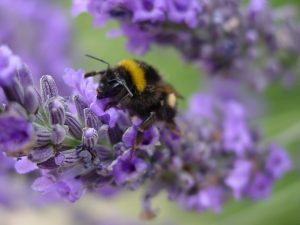 At this time of the year, the brilliant purple/blue flowers of the lavender draw hundreds of friendly bumble bees, small youngsters and large adults, who climb up & down each flower head, while probing into each tiny separate flower. Unlike honey bees…bumble bees eg. Bombus Terrestris are not normally aggressive & can be easily watched closeup, especially if they have become intoxicated with flower fragrance or just tired with hard work. The larger queens often find their way indoors accidentally as they seek a place to make a home. In a previous blog post I made mention of a French writer’s quote regarding dogs and humans. That writer was none other than Anatole France ( 1844-1924). Anatole received the Nobel prize for literature back in 1921 and the true quote was: “Until one has loved an animal, a part of one’s soul remains unawakened” And so it is we read now about the ill treatment of bobby calves on our NZ dairy farms, as their owner operators strive to produce higher and higher profits from ever increasing dairy herds. It was Mahatma Gandhi who wrote: “The greatness of a nation and its moral progress can be judged by the way its animals are treated” Without being too simplistic, isn’t it greed for money that has become more of the main driver in terms of how we farm our animals such as sheep, pigs, hens & now cows and their calves? The front desk is staffed daily, from 0700 to 2300 hours. Le Petit Hotel is a B & B in Sumner, Christchurch. Le Petit Hotel, St Martin, is a superb beachfront Caribbean hotel, on the shore of Grand Case Bay. It offers unique world class resort accommodation and guests enjoy easy access to the Island’s renowned French restaurants nearby. Owners Kristin & Marc operate Le Petit Hotel together with L’Esplanade Hotel and both St Martin/ St Maarten hotels provide exceptional Trip Advisor Winning comfort & service.